Norepinephrine serves as a neurotransmitter for a population of neurons the cell bodies of which reside in a brainstem nucleus and the axons of which project widely to discrete subsets of forebrain neurons. Norepinephrine powerfully inhibits epileptogenesis in the kindling model. Pharmacological methods have demonstrated that the antiepileptogenic actions of norepinephrine are exerted via α2 adrenergic receptors residing on targets of noradrenergic neurons. The existence of three α2 adrenergic receptor subtypes together with the lack of subtype-specific ligands has precluded understanding the role of individual α2 adrenergic receptor subtypes in the antiepileptogenic actions of norepinephrine. Gene targeting was used to introduce a point mutation into the α2A adrenergic subtype in the mouse genome. The mutation produced a marked enhancement of epileptogenesis and abolished the proepileptogenic actions of the α2 adrenergic receptor antagonist idazoxan. These studies reveal the crucial contribution of the α2A receptor subtype in suppression of epileptogenesis. Development of agents that promote selective activation of the α2A receptor subtype may provide novel therapeutic strategies for the prophylaxis of epilepsy. Physiological forms of neuronal activity mediate experience-determined plasticities required for the normal development of the mammalian nervous system (Hubel and Wiesel, 1965). By analogy, pathological forms of neuronal activity mediate experimentally induced plasticities of the mature mammalian nervous system that serve as models of human disease (Routbort and McNamara, 1996). One example of experimentally induced plasticities is the kindling model of epilepsy, in which repeated administration of an initially subconvulsive electrical stimulus results in progressive intensification of seizures, culminating in tonic–clonic seizures (Goddard et al., 1969). Once established, the enhanced sensitivity to electrical stimulation persists for the life of the animal. Understanding the cellular and molecular mechanisms mediating the development of epilepsy (i.e., epileptogenesis) in this animal model may lead to prophylaxis of human epilepsies. Several monoamines [acetylcholine, dopamine, norepinephrine (NE), and serotonin] serve as neurotransmitters for populations of neurons the cell bodies of which reside in brainstem nuclei and the axons of which project widely to discrete subsets of forebrain neurons. NE is unique among the monoamine transmitters in that it exerts powerful antiepileptogenic actions (McNamara et al., 1987); selective depletion of NE by microinjection of 6-hydroxydopamine into the bundle carrying the axons of NE neurons from their cell bodies in the locus ceruleus to the forebrain markedly facilitates the rate of kindling development (Corcoran and Mason, 1980). In contrast, depletion of NE after kindling has been established does not affect the duration or intensity of kindled seizures (Westerberg et al., 1984). The antiepileptogenic actions of NE are mediated by the α2 subtype of NE receptor (Gellman et al., 1987); the presence of reduced α2 receptor binding in amygdala and pyriform cortex (Chen et al., 1990) together with reduced responsiveness of pyriform cortical neurons to α2 agonists (McIntyre and Wong, 1986) in kindled animals suggests that impaired activation of α2 receptors may contribute to epileptogenesis in the kindling model. Pharmacological and, more recently, molecular cloning strategies have revealed the existence of three distinct α2 adrenergic receptor (AR) subtypes, α2A AR, α2B AR, and α2C AR (for review, see Bylund et al., 1994). All three α2 AR subtypes are coupled to multiple effector systems in native target cells via interaction with the Giand Go subset of heterotrimeric G-proteins, including attenuation of adenylyl cyclase activity, activation of receptor-operated K+ channels, and suppression of voltage-gated Ca2+ channels. Because subtype-specific α2 AR agonists and antagonists do not exist and all three α2 AR subtypes couple to similar effector systems, it has not been possible to define the α2 AR subtype(s) that mediates the effects of endogenous NE on neuronal plasticity, including the suppression of epileptogenesis in the kindling model. The present studies take advantage of a recently developed mouse line expressing a defective α2A AR receptor subtype. This genetically modified mouse line was achieved by a hit-and-run gene-targeting strategy to substitute the wild-type α2A AR locus with a mutant gene encoding a subtly mutated α2A AR receptor, the D79N α2A AR, which contains an aspartate to asparagine substitution (MacMillan et al., 1996). The D79N mutant mouse has an unexpected 80% reduction in functional α2A AR density that, combined with the intrinsic alteration in G-protein coupling characteristic of the D79N α2A AR (Surprenant et al., 1992; Ceresa and Limbird, 1994), likely explains the observation that the D79N mouse behaves as a “functional” α2A AR knock-out (MacMillan et al., 1996; Lakhlani et al., 1997). Consequently, this mouse line offers a powerful genetic tool to explore whether or not the α2A AR subtype mediates the powerful antiepileptogenic effects of NE in the kindling model. Parts of this paper have been published previously in abstract form (Janumpalli et al., 1996). Mice. The mutant mice evaluated in these studies were developed using the two-step hit-and-run gene-targeting approach in mouse 129/Sv embryonic stem cells (Hasty and Bradley, 1993) to establish a mouse line with this D79N α2A AR mutation (MacMillan et al., 1996). The offspring of the chimeric animals were backcrossed against 129/SvEv or C57BL/6 animals. In the studies reported here, both wild-type and mutant littermates from heterozygous matings of B6 and 129 animals and wild-type and mutant offspring on a pure 129/SvEv genetic background were evaluated. The indistinguishable results obtained for the D79N α2A AR mutant animals on both genetic backgrounds provides confidence that the findings obtained are indeed attributable to perturbation of the α2A AR structure in vivo and not to other genetic variables. Objectivity. All aspects of these experiments, including surgery, drug treatment, kindling, and histological analysis, were performed in a blinded manner. The investigator remained blinded to both the genotype of the animals as well as to the drug (idazoxan vs vehicle) being administered before electrical stimulation. Surgery. Both wild-type (WT) and homozygous D79N α2A AR mutant 129/SvEv male mice, ∼5 months old, underwent stereotaxic implantation of a bipolar electrode in the right amygdaloid complex under pentobarbital anesthesia (Nembutal, 50 mg/kg, i.p. ; Abbott Labs, Irving, TX) using the following coordinates: +0.29 cm lateral and −0.07 cm posterior with reference to bregma and −0.46 cm ventral to dura mater. In addition, a ground wire was attached to a stainless steel screw overlying the left frontal cortex. The electrode assembly and screw were secured to the skull with dental acrylic. Kindling. Kindling stimulations were administered once a day between 8 A.M. and 5 P.M., 5 d per week with an interstimulus interval of at least 19 hr. The electrographic seizure threshold (EST) was determined by application of a constant current stimulus (biphasic rectangular pulses, each 1 msec in duration, delivered at 60 Hz for 1 sec from a Grass model S88 stimulator) beginning at 40 μA that was followed by trains of increasing (by 20 μA) current intensity administered at 1 min intervals until an electrographic seizure was observed on the electroencephalograph (EEG). Accurate delivery of the stimulus was monitored on a Tektronix type 502A oscilloscope by measuring the voltage drop across a 1O kΩ resistor connected in series with the animal. For the second stimulation, the applied current intensity was increased to 25% above the EST. The evoked behavioral seizures were classified according to a modification of the scheme of Racine (1972) as follows: (1) chewing and drooling, (2) head nodding, (3) unilateral forelimb clonus, (4) bilateral forelimb clonus, (5) bilateral forelimb and/or hindlimb clonus with falling, (6) running or jumping seizure, (7) tonic hindlimb extension, and (8) tonic seizure activity culminating in death. The EEG was recorded using a Grass model 78 polygraph before stimulation, during seizure activity, and after seizure until prestimulation activity was re-established. Animals underwent stimulation until three consecutive class 5 seizures with tonic and/or clonic activity of at least 12 sec occurred, the criterion for kindling. Drug administration. Animals of both genotypes were distributed into control (n = 11 each of WT and D79N mice) groups that received either 3 ml/kg of 0.9% saline intraperitoneally (i.e., vehicle) or the α2 AR antagonist idazoxan (3 mg/kg, i.p. ), respectively. After a postoperative recovery period of at least 1 week, drugs were administered 20 min before each stimulation. Preliminary experiments were performed to optimize the dose of idazoxan that exerted maximal facilitating effects on the rate of kindling development in mice. We determined the number of stimulations required to evoke three consecutive class 4 or 5 seizures in the presence of vehicle or one of three doses of idaxozan (0.3, 1.0, or 3.0 mg/kg). The progression of kindling was equivalent with either 1.0 or 3.0 mg/kg (data not shown). To ensure maximal antagonism of the α2 adrenergic receptors in these experiments, we administered idazoxan at a dose of 3 mg/kg. Histology. Animals were killed in pairs (control and experimental), and the brain was removed and frozen in isopentane in a dry ice/methanol bath. Frozen sections (20 μm) were thaw-mounted onto gelatin-coated slides and stained with methyl green-pyronine-Y for determination of electrode placement. The development of kindling was measured by both electrophysiological and behavioral indices of seizure duration and intensity. WT and D79N mice were monitored by EEG during and after a brief electrical stimulation administered once each day (see Materials and Methods); this permitted quantitation of the electrographic seizure duration (ESD) and EST as electrophysiological data to complement the behavioral observations. The development of kindling proceeded more rapidly in the D79N mutant mice compared with WT mice, as evident in behavioral indices of seizure intensity (seizure class) (Fig.1A); the number of stimulations required to induce the class 5 behavioral seizure of intensity used as criterion of kindling in the D79N mice (6.0 ± 0.52) was less than half of the number of stimulations required for the WT mice (15.6 ± 1.48; p < 0.01; Dunnett’s multiple comparisons test) (see Fig. 3). A, The effect of an α2 adrenergic receptor antagonist (idazoxan) or mutation of the α2A adrenergic receptor on stimulation-evoked seizure activity depicted as behavioral seizure class (defined in Materials and Methods) in four groups of mice. Data are mean ± SE. 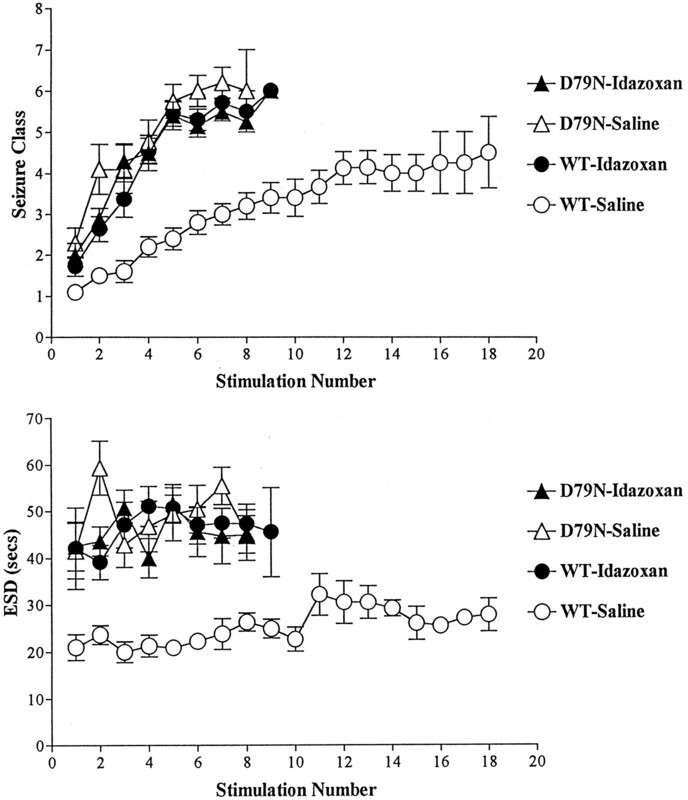 Note the greater intensity of behavioral seizures in the D79N-saline (n = 10) and idazoxan-treated WT or D79N (n = 11 for each) mice in comparison with WT-saline mice (n = 10) evoked with each stimulus. B, The ESD elicited by each stimulation in the four groups of mice. Data are mean ± SE. Note the greater duration of ESD in the D79N and idazoxan-treated mice in comparison with WT-saline mice in response to each stimulation. These differences in behavioral seizure indices were paralleled by differences in electrophysiological measures of seizure duration. A representative electrographic seizure evoked by the initial stimulation of a WT mouse and a D79N mouse is depicted in Figure2 and demonstrates that the duration of the electrographic seizure (ESD) evoked by the initial stimulation was more than twice as long in the vehicle-treated D79N mice (43.5 ± 5.60 sec) compared with the electrographic seizure duration in WT animals (21.0 ± 2.74 sec) (Fig. 1B;p < 0.05; Dunnett’s multiple comparisons test). This nearly twofold increase in duration of electrographic seizure in the D79N mice compared with that of the WT mice was sustained throughout the evolution of kindling (Fig. 1B). Representative electrographic seizure elicited by initial stimulation in wild-type (WT) and mutant (D79N) mice. The recording between thearrows in each tracing denotes the electrographic seizure. The electrographic seizure duration (presented in groups of animals in Fig. 1B) is the time elapsed between the onset of stimulation artifact and the termination of electrographic seizure (marked by the arrow on theright of each tracing). The electrographic seizure of 51 sec duration evoked in the D79N mouse was accompanied by a behavioral seizure of class 2. The briefer electrographic seizure (20 sec) evoked in the WT mouse was accompanied by a behavioral seizure of class 1. Despite the striking differences in duration and intensity of electrographic and behavioral seizures, the electrical currents required to evoke the initial electrographic seizure in the D79N and the WT mice were similar (170 ± 20.3 and 208 ± 49.7 μA, respectively; p > 0.05; Dunnett’s multiple comparisons test). The studies shown in Figures 1 and 2 were obtained in WT and D79N mice in the pure 129/SvEv genetic background. It is important to note, however, that facilitation of the rate of kindling development was observed also in D79N mice compared with WT mice backcrossed against a different genetic background, namely, C57BL/6 (see Materials and Methods). The number of stimulations required to achieve kindling criterion was 6.0 ± 0.98 and 10.0 ± 1.2 for D79N and WT, respectively, in the B6,129 hybrid mice (p < 0.005; two-tailed t test). The α2 AR antagonist idazoxan facilitated kindling development in mature WT mice (Fig. 1) in a manner that was indistinguishable from our previous findings for mature rats (Gellman et al., 1987). Treatment of WT mice with the antagonist idazoxan accelerated the progression of kindling, as evident by comparison of the behavioral seizure class attained at each stimulation for the vehicle- and idazoxan-treated WT mice (Fig. 1A). The behavioral seizure (Fig.1A) evoked by the initial stimulation of the idazoxan-treated mice was more intense (1.72 ± 0.24) than that of WT animals treated with vehicle (1.1 ± 0.10). The number of stimulations required to achieve kindling was 6.9 ± 0.37 for idazoxan-treated WT mice compared with 15.6 ± 1.48 stimulations for WT animals treated not with idazoxan but with vehicle instead (p < 0.01; Dunnett’s multiple comparisons test) (Fig. 3). These differences in behavioral seizure indices were paralleled by differences in electrophysiological measures of seizure duration. The duration of the electrographic seizure (Fig. 1B) evoked by the initial stimulation was increased by approximately twofold in WT mice treated with the α2 AR antagonist idazoxan (42.1 ± 8.69) compared with WT mice treated with vehicle (i.e., control; 21.0 ± 2.74; p < 0.05; Dunnett’s multiple comparisons test) (Fig. 1B). An increase in electrographic seizure duration was also evident in subsequent stimulation-evoked seizures in idazoxan-treated mice compared with WT mice (Fig.1B). Mutation of the α2A AR subtype mimics facilitation of epileptogenesis induced by blockade of multiple α2 AR subtypes by idazoxan as defined by reaching the criterion of kindling, namely, three consecutive class 5 seizures. The data shown are mean ± SE. The number of stimulations required to reach kindling criterion was significantly greater (p < 0.001) in the WT-saline (n = 10) animals compared with the other three groups, but no significant differences were found in comparing WT-idazoxan (n = 11) with D79N-saline (n = 10) or D79N-idazoxan (n = 11) mice. An important consideration in the interpretation of findings from genetically modified mice is whether the impairment noted in adult mice results from impaired signaling because of receptor defects in the mature animal or, instead, results from a receptor-dependent perturbation of the developmental program that gives rise to widespread changes in animal physiology and behavior, including the functional properties being evaluated by the investigator in the mature animal. The effects of acute administration of idazoxan on the initiation and progression of kindling development in WT mice provided the opportunity to explore whether impaired α2 AR function in mature D79N mice is sufficient to account for the facilitated development of kindling noted in the D79N mice. If so, then the rates of kindling development in WT mice treated with idazoxan should be equivalent to the findings for D79N mice in the absence of α2 antagonist (i.e., treated with vehicle). In fact, this is what was observed. The development of kindling in WT mice treated with idazoxan exhibited striking similarity to the pattern for kindling development in D79N mutant mice treated with vehicle (Fig. 1A,B). In addition, the duration of the electrographic seizure evoked by the initial electrical stimulation was equivalent in the idazoxan-treated WT group and in the vehicle-treated D79N group (42.1 ± 8.69 and 43.5 ± 5.61, respectively; Fig. 1B). The behavioral seizures accompanying these electrographic seizures also were equivalent (seizure class, 1.72 ± 0.24 and 2.3 ± 0.37, respectively; Fig. 1A). Similarly, the number of stimulations required to achieve kindling was 6.9 ± 0.37 for idazoxan-treated WT mice compared with 6.0 ± 0.52 for vehicle-treated D79N mutant mice (Fig. 3). As indicated in the introductory remarks, there are three known α2 receptor subtypes. Idazoxan is an effective antagonist at all three subtypes. To determine whether the mutation of the α2A subtype was sufficient to account for all of the facilitatory effects of idazoxan on kindling development, we compared the rates of kindling development in the mutant mice treated with vehicle or idazoxan. In contrast to its robust effects in wild-type mice, idazoxan treatment had no detectable effects on kindling development in D79N mice. That is, behavioral and electrophysiological responses to the initial stimulation and the progression of kindling development were equivalent in D79N mice treated with vehicle or idazoxan (Fig. 1A,B). The number of stimulations required to achieve kindling criterion was 6.0 ± 0.52 for the D79N-vehicle and 6.8 ± 0.47 for the D79N-idazoxan mice (p < 0.05; Dunnett’s multiple comparisons test) (Fig. 3). Taken together, these findings are consistent with the interpretation that the α2A adrenergic receptor subtype is sufficient to account for the proepileptogenic effects of α2 AR antagonists. The absence of altered expression of α2B or α2C subtypes in the brain of mature D79N mice compared with wild-type mice, assessed by measures of receptor density using radioligand-binding studies (L. MacMillan, M. Wilson, and L. Limbird, unpublished observations) or of mRNA expression using in situ hybridization (R. Wang and L. Limbird, unpublished observations), further supports the pivotal role of the α2A adrenergic receptor subtype in this phenotype. Several important conclusions can be made based on the novel findings of this study. First, the facilitation of kindling development in the D79N mice in the absence of exogenous agents implicates the α2A AR subtype in limiting epileptogenesis induced by electrical stimulations. Second, the equivalent rates of kindling development in mature WT mice treated with the α2 AR antagonist idazoxan and in D79N mice treated with vehicle support the conclusion that the proepileptogenic effects of this mutation are mediated on the mature nervous system. Third, the equivalent rates of kindling development in the D79N mice treated with the nonsubtype-selective α2 AR antagonist idazoxan or vehicle support the conclusion that the α2A subtype is sufficient to account for the proepileptogenic effects of α2 AR antagonists and, by implication, the antiepileptogenic effects of endogenous norepinephrine. Evidence that the α2A AR subtype is sufficient to mediate all of the antiepileptogenic effects of NE sharpens the focus of investigations aimed at elucidating mechanisms of kindling development. Insights from diverse approaches support the conclusion that impaired activation of α2 AR residing on neurons in the amygdala and pyriform cortex may contribute to epileptogenesis in this model. Previous reports that local depletion of NE in the amygdala–pyriform cortex facilitates kindling development (McIntyre, 1980) suggested a pivotal role for NE release in this region of forebrain, in particular. Quantitative radiohistochemical studies demonstrated selective reductions of radiolabeled α2 adrenergic agonist (para-[3H]aminoclonidine) binding in the pyriform cortex and three amygdaloid nuclei but not in nine other brain regions in kindled animals (Chen et al., 1990). The reduction of α2 AR binding may contribute to the decreased responsiveness of these neurons to α2 AR agonists. Consistent with this hypothesis, intracellular recordings disclosed a 16-fold increase in the duration of burst firing of pyriform cortex neurons in slices isolated from kindled compared with control animals, and bath-applied α2 AR agonists inhibited the burst firing in slices obtained from control animals with greater efficacy and/or potency than was seen in slices obtained from kindled animals (McIntyre and Wong, 1986). The present findings, which demonstrate that the α2A AR subtype is sufficient to mediate the antiepileptogenic actions of NE, will guide investigations of the molecular basis and cellular consequences of this defect. Our findings raise the possibility that mutations of the α2A AR subtype, or of molecules that mediate its effects on neuronal excitability, contribute to the development of familial epilepsies in humans. We have not observed spontaneous epileptic seizures in the D79N mice, nor have unexpected deaths occurred in these mice as have occurred in other mutant mice with epilepsy (Tecott et al., 1995). However, we were intrigued by the report of a familial partial epilepsy that has recently been mapped to a 10 centimorgan interval on human chromosome 10 (Ottman et al., 1995), near the locus for the human α2A AR gene (Kobilka et al., 1987). However, direct sequencing of the DNA of two affected family members disclosed no mutations in the coding region for the α2A AR (Wilson et al., 1997). The present findings suggest novel therapeutic strategies for prophylaxis of epilepsy. Currently available drugs inhibit seizures in ∼70% of patients with epilepsy, an effect often accompanied by undesirable side effects (McNamara, 1994). However, to date, not a single drug has been identified that prevents development of epilepsy in humans. Extant data support the idea that kindlingis an informative animal model for human epilepsies arising months to years after brain injury caused by trauma, stroke, etc. (McNamara, 1994). Subtype specific drugs offer the possibility of maximizing desired and minimizing undesired effects inherent in nonselective drugs. Our demonstration that a specific α2 receptor, the α2A subtype, mediates the antiepileptogenic effects of NE offers the possibility of developing receptor subtype specific compounds aimed at limiting kindling development and potentially preventing some forms of epileptogenesis in human beings. Revision received January 5, 1998. This work was supported by the National Institutes of Health Grants NS 17771 to J.O.M. and HL 43671 to L.E.L. L.E.L. is the recipient of an Established Investigator award from the National Alliance for Research on Schizophrenia and Depression, which made possible the development of the D79N mutant mice. Correspondence should be addressed to Dr. James O. McNamara, Duke University Medical Center, Epilepsy Research Laboratory, 401 Bryan Research Building, Duke Box 3676, Durham, NC 27710. (1994) Adrenergic receptor subtypes. Pharmacol Rev 46:121–136. (1994) Mutation of an aspartate residue highly conserved among G-protein-coupled receptors results in nonreciprocal disruption of alpha 2-adrenergic receptor-G-protein interactions. J Biol Chem 269:29557–29564. (1990) Biochemical and radiohistochemical analyses of alpha-2 adrenergic receptors in the kindling model of epilepsy. J Pharmacol Exp Ther 253:1272–1277. (1980) Role of forebrain catecholamines in amygdaloid kindling. Brain Res 190:473–484. (1987) Alpha-2 receptors mediate endogenous noradrenergic suppression of kindling development. J Pharmacol Exp Ther 241:891–898. (1969) A permanent change in brain function resulting from daily electrical stimulation. Exp Neurol 25:295–330. (1993) Gene targeting vectors for mammalian cells. in Gene targeting. A practical approach, ed Joyner JL (Oxford UP, New York), p 1031. (1996) A point mutation (D79N) of the α2A receptor abolishes the antiepileptogenic action of norepinephrine. Soc Neurosci Abstr 22:2088. (1987) Cloning, sequencing, and expression of the gene coding for the human platelet α2-adrenergic receptor. Science 238:650–656. (1997) Substitution of a mutant α2A-adrenergic receptor via “hit and run” gene targeting reveals the role of this subtype in sedative, analgesic, and anesthetic-sparing responses in vivo. Proc Natl Acad Sci USA 94:9950–9955. (1980) Amygdala kindling in rats: facilitation after local amygdala norepinephrine depletion with 6-hydroxydopamine. Exp Neurol 69:395–407. (1986) Cellular and synaptic properties of amygdala-kindled pyriform cortex in vitro. J Neurophysiol 55:1295–1307. (1994) Cellular and molecular basis of epilepsy. J Neurosci 14:3413–3425. (1987) Biochemical and pharmacologic studies of neurotransmitters in the kindling model. in Neurotransmitters and epilepsy, eds Jobe PC, Laird HE (Humana, Clifton, NJ), pp 115–160. (1995) Localization of a gene for partial epilepsy to chromosome 10q. Nat Genet 10:56–60. (1996) Excitatory amino acids and use-dependent plasticity: epileptogenesis. in Excitatory amino acids and the cerebral cortex, eds Conti F, Hicks TP (MIT, Cambridge, MA), pp 313–323. (1992) A point mutation of the α2-adrenoceptor that blocks coupling to potassium but not calcium currents. Science 257:977–980. (1995) Eating disorder and epilepsy in mice lacking 5-HT2c serotonin receptors. Nature 374:542–546. (1984) Depletion of noradrenaline fails to affect kindled seizures. Exp Neurol 84:237–240. (1997) Evaluation of the α2A-adrenergic receptor as a candidate gene for an autosomal dominant form of human epilepsy. (American Epilepsy Society, Boston).